An epilepsy drug can stop cocaine use in hard-core addicts, research in the journal Synapse suggests. Experts from New York University found the drug, vigabatrin, works by eliminating the craving for cocaine. Four out of ten hard-core addicts given the drug were able to stay clean for more than 60 days. Lead researcher Professor Jonathan Brodie said: "Our results were more spectacular than we would have ever dreamed." "These addicts were able to stay clean even without leaving the environment that had fostered their addiction. They gained weight, they got jobs, and they are now living with their families." Dr Emilia Figueroa, who treats addicts in Mexico and who also worked on the study, said: "For the first time it seems that we might have a way to treat people suffering from the life-threatening consequences of cocaine addiction." Vigabatrin, also known by the trade name Sabril, has been used in Europe and many other countries to treat infantile spasms and epilepsy. It appears to work preventing cocaine from triggering the release of a brain chemical called dopamine, which controls mood, and which, at higher levels, can produce feelings of intense pleasure - the high associated with taking drugs. In total, 20 addicts, 19 men and one woman, who had been using cocaine daily for three to 15 years, took part in the study. In the first 10 days of the trial, eight subjects dropped out because they did not want to stop using cocaine. Among the 12 remaining subjects, eight remained free of cocaine more than four weeks after their vigabatrin treatment ended, and reported that their craving for cocaine had not returned. The only side effects appeared to be daytime sleepiness and minor headaches. Everybody who stopped using cocaine also gained weight. However, none of the addicts reported disturbances in their vision - a known potential side effect of vigabatrin use. Lesley King-Lewis, chief executive of Action on Addiction, told BBC News Online: "If this drug interferes with the dopamine reward pathway it could be useful in treating many addictions. 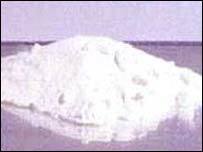 "However, this was a very small sample, out of which very few patients actually came off cocaine. "Those who did should be followed up over a longer period of time to see how effective the drug really was at helping them to beat their addiction."